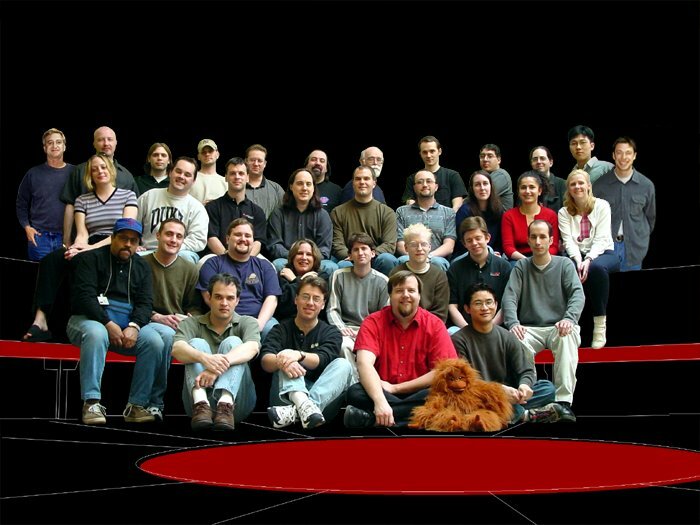 This is a list of the various people in the development team for Morrowind. 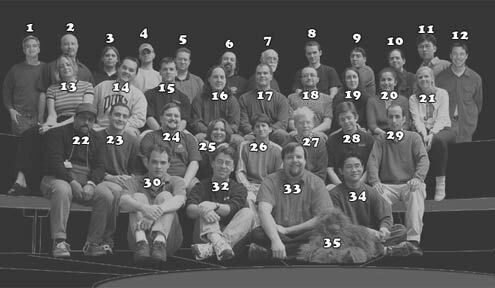 The Morrowind development team with numbers to indicate who they are (See below). Also know as simply GT or WormGod, GT is once again working on the graphics for Morrowind, among other things. GT was also involved with Redguard and Battlespire (graphics and level design). Goodall created the vast majority of the game's faction quests. He left Bethesda shortly after Morrowind's release. Worked on the Xbox port of Morrowind. Hicks is no longer with Bethesda. He is currently pursuing a Doctor of Pharmacy degree at Texas A&M. Nelson is no longer at Bethesda, but before he left, he worked on both Bloodmoon and Oblivion. Pete is the overall marketing and PR person for Bethesda so is obviously involved with Morrowind. Morrowind is his first Elder Scrolls title he has been involved with although he was with the Adrenaline Vault website for three years prior to coming to Bethesda. Craig is the main programmer for Morrowind and has been with Bethesda for 10 years. He has done work on Redguard, Daggerfall, and Arena. Christiane is the lead character animator for Morrowind. Todd is the project leader for Morrowind and was also the designer for Redguard. He was also involved in the design of Daggerfall and designed/produced Future Shock and SkyNET. Mark is a long time freelance artist for the Elder Scrolls series and is again working on Morrowind. I believe Mark has done work on every ES game out there (with the exception of Oblivion) as well as worked on SkyNET. He also created the first Scamps. Michael is no longer with Bethesda but was heavily involved with the development of the Elder Scrolls game series. Julian is no longer working for Bethesda but rumours have it that he was involved in the design phase of the game and did some contract design and programming. This page was last modified on 18 January 2017, at 17:32.